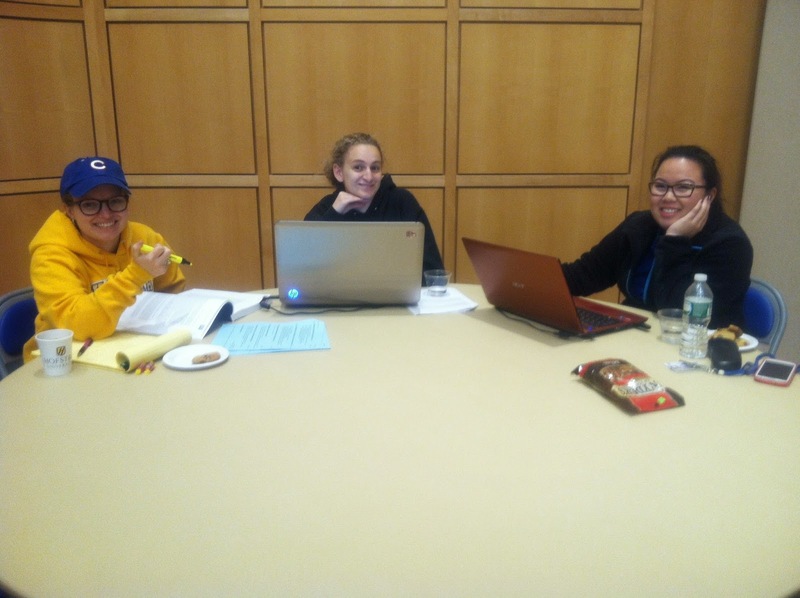 Over 80 Students Enjoy "Coffee, Cookies, and Cramming II" Late-Night Writing Extravaganza! 84 students dropped by our "Coffee, Cookies, and Cramming II" Late-Night Writing Event on Sunday, April 27th, from 6PM-1AM for treats, tutoring, and good company while working on writing projects and studying! After praising our "great snacks," one attendee wrote of her experience: ". . . [T]he writing tutors are honestly the best part. They come around every half an hour to check up on everyone and offer their assistance. They are some of the nicest people I have ever met. They are positive . . . , which encourages me to go to the writing center." Great thanks to our awesome tutors--Julia, Michael, Melissa P., Brendan, Theresa, Sarah, Ben, Nolan, and Kate--for making this event such a resounding success! 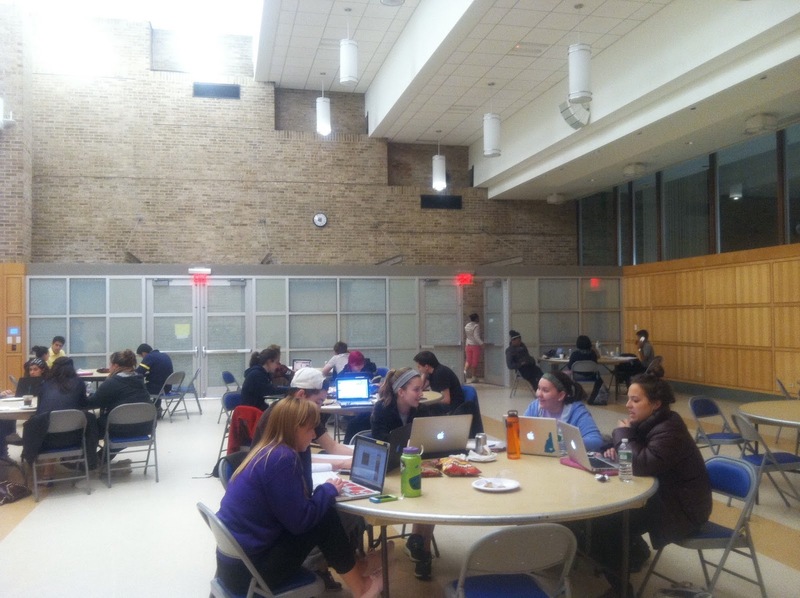 Students hard at work at Coffee, Cookies, and Cramming II!--Photo by Michael Heiss. Students keeping things light while they work on their writing projects!--Photo by Melissa Pagnotta. Full house!--Photo by Michael Heiss. 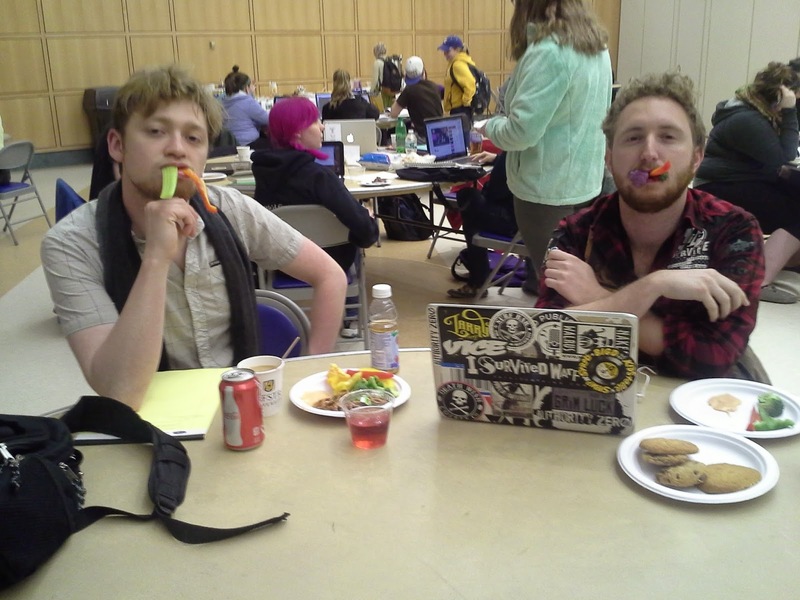 Our tutor Ben on the job at Coffee, Cookies, and Cramming II!--Photo by Michael Heiss. Work on Your End-of-the-Semester Writing Projects at "Coffee, Cookies, and Cramming II" -- 6PM-1AM, Sunday, April 27th, Student Center Multi-purpose Room! Do you need to make progress on your end-of-the semester writing projects? 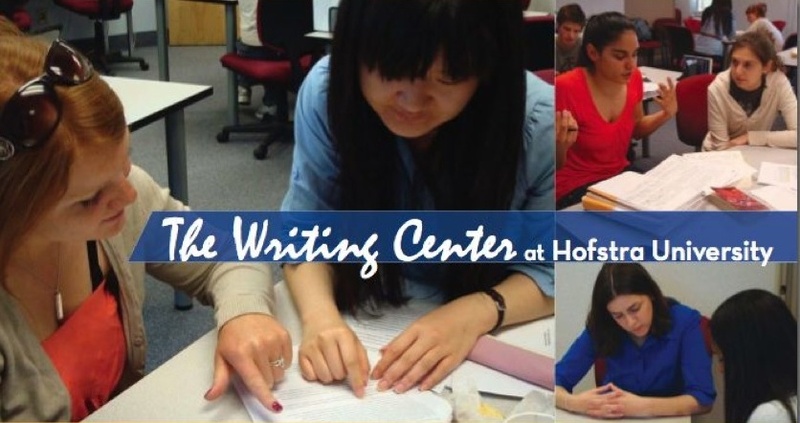 Hofstra's Writing Center Tutors invite you to bring your final papers, resumes, job application letters, and creative projects to "Coffee, Cookies, and Cramming II" for our late-night writing extravaganza. You bring your writing projects and a laptop or pen and paper. We'll bring tasty snacks, good company, and free writing tutoring (if you want it). 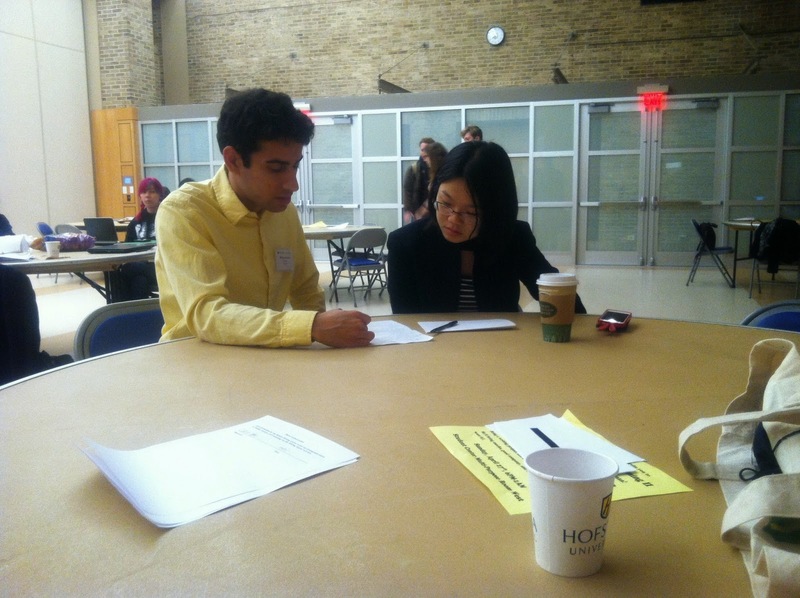 Melissa P. and Sarah present posters at the Colonial Academic Alliance Conference! Congratulations to our peer tutors Melissa P. and Sarah, who presented their research in poster sessions at the Colonial Academic Alliance Conference on April 12th at Towson University in Maryland. 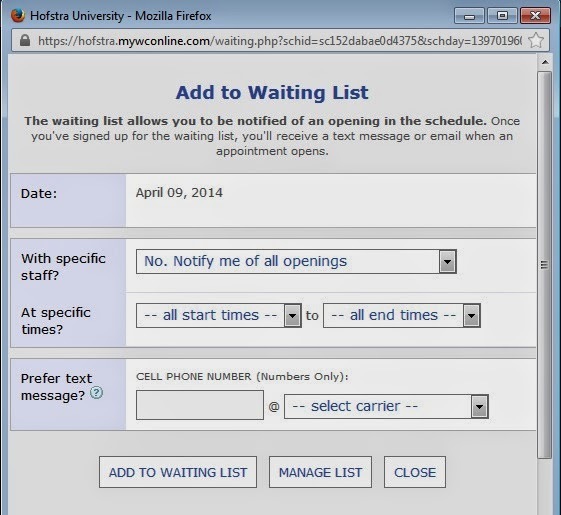 New Wait List Feature Notifies You When Your Chosen Appointment Time Becomes Available! Is the appointment time you wanted taken? Try our new WAIT LIST feature! Click on the little clock by the name of the day when you want an appointment and note the times you'd prefer, the tutors you'd prefer, and whether you'd like to be notified of an available time by text message or via e-mail. If someone cancels, you'll get a text or an email telling you that that slot on the schedule is now available.